Give yourself a break from the holiday madness with our Snow Bath Bomb. Each bath bomb gives off scents of mint, pint, and spiced wood and herbs and releases trails of lilac and purple with traces of clear glitter. Packed with essential oils, it’s the perfect way to give yourself a break from the crazy parts of the holidays while relaxing in the the best parts of the holidays all at once. 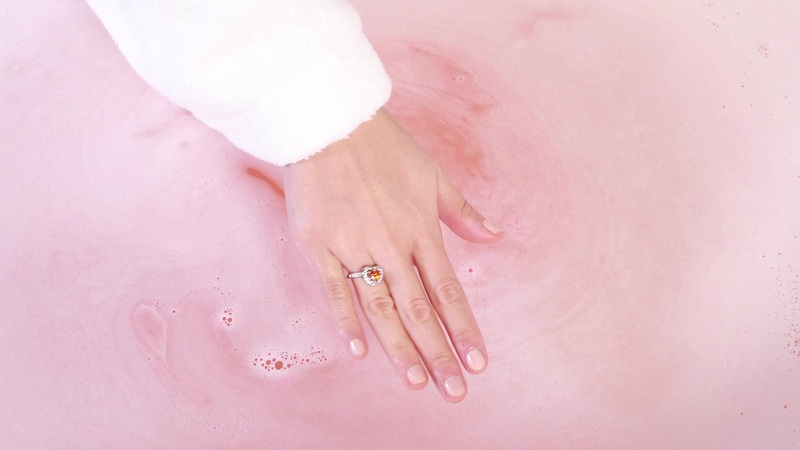 In each bath bomb, you’ll discover 1 of 12 vintage-inspired rings with a Crystal Lilac Swarovski center stone adorned with dazzling clear CZ stones. Each ring floats to the top in a plastic pod like your own secret gift to yourself. Our Snow Rings appear like adorable little snowflakes decorating your fingers. All 12 feature a vintage-inspired band with a Crystal Lilac Swarovski center stone adorned with dazzling clear CZ stones. Scent: Mint, eucalyptus, orange, pine, spiced wood, & herbs.